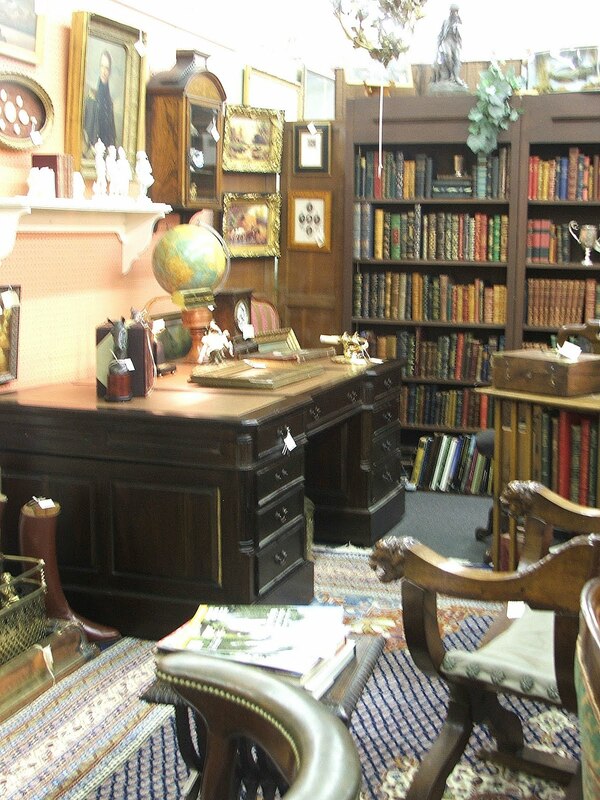 A couple of days ago I showed you my booth in West End Antique Mall. Thank you so much for all the sweet comments left for me. I truly appreciate you taking the time out of your busy life to comment. 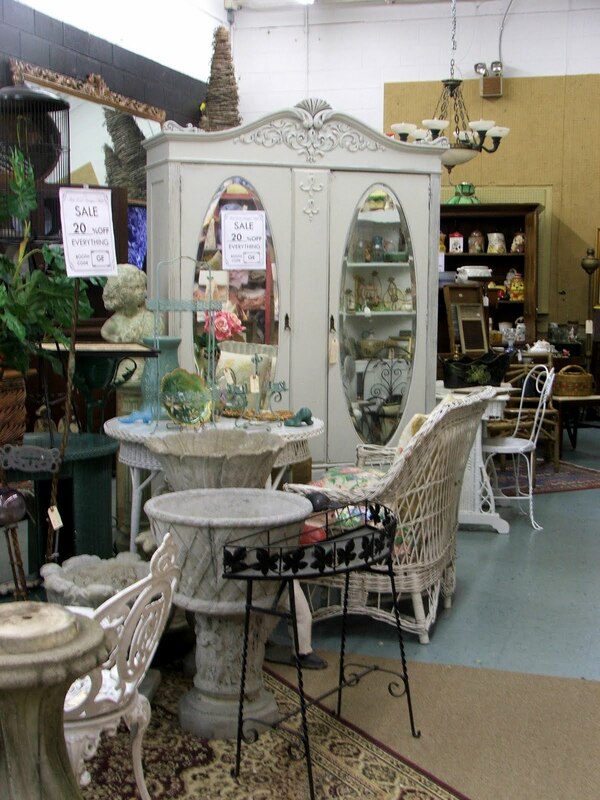 Today we will go shopping in some of the other booths in the antique mall. 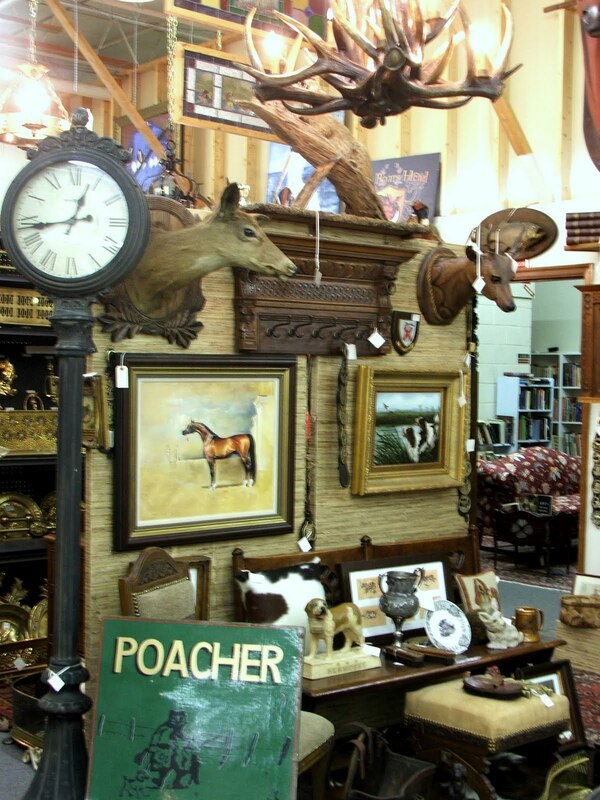 With 250 dealers you are sure to find something to take home. Enjoy! You have to know I love this booth . They carry a lot of transferware. 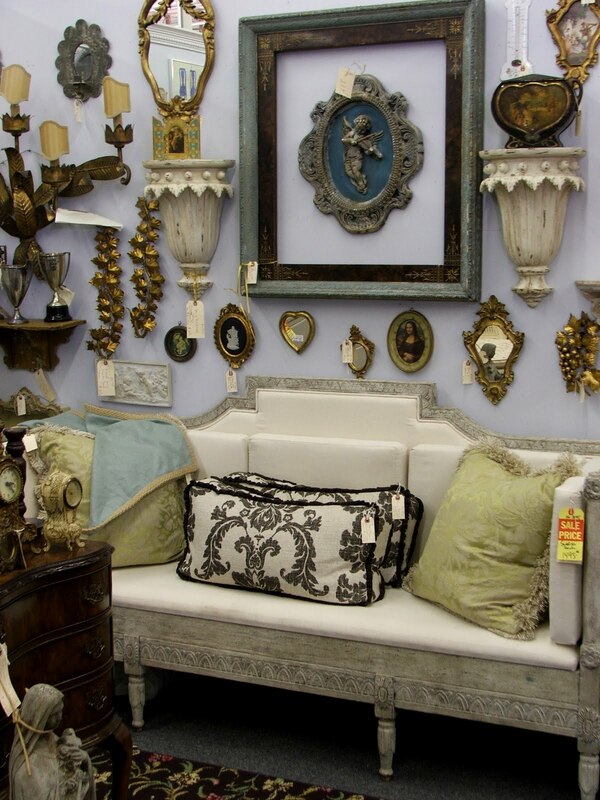 This is one of only a few booths that carry painted furniture. I would love to take the antique English water filter home with me. There are hundreds of antique books in this space. Do you see all the coral? Gorgeous! This reminds me of shops in England. Thanks for stopping by and browsing the mall with me. 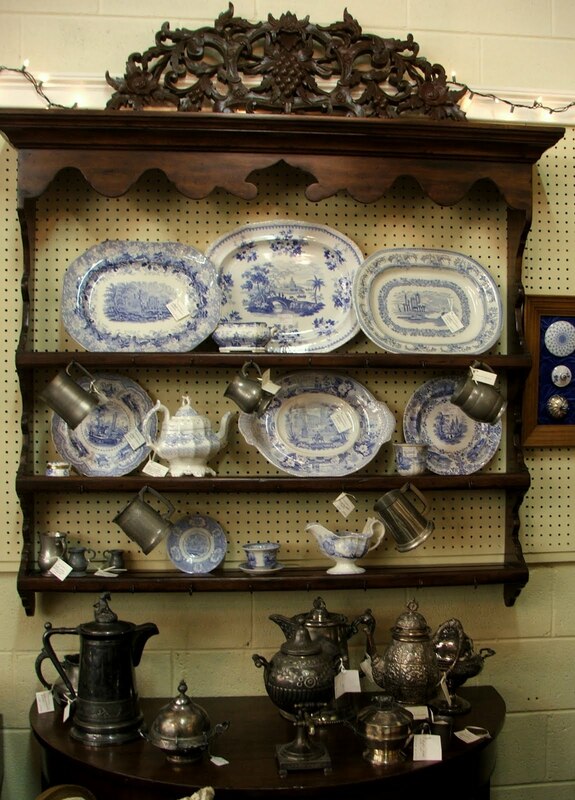 If any of you are ever in Richmond I would love to go antiquing with you… I know all the great places. Hello, Are there any Virginia bloggers out there? The only one I am aware of is Mikey at Shabby French Cottage. Mikey and I shop at the same places and I have to beat him there or all the good stuff is gone! It seems like Georgia, Texas and California have the most bloggers and Virginia hasn’t caught on yet. If you do live in Virginia I would love to hear from you. I’ll be joining the parties at Colorado lady, Color Outside The Lines, Common Ground and My Romantic Home. Been on vacation, so I'm only just catching up. 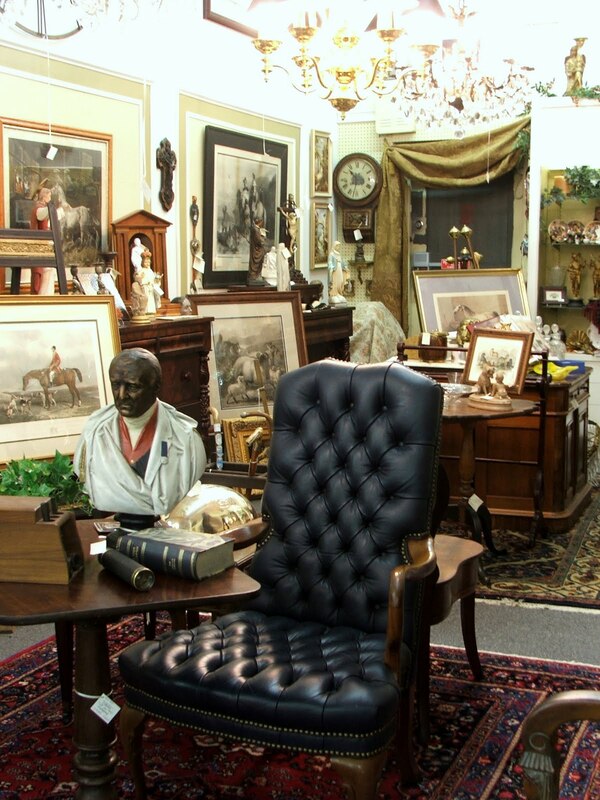 Love your booth Sherry – some fabulous things there, and your tour today had got me wanting to buy an air ticket! What beautiful booth spaces. I was at an antique mall on Saturday that made me so claustrophobic I wanted to run away, not shop. What you are showing is inspiring and welcoming. This is gorgeous!!! I keep telling my husband I want to have a trip to VA and he keeps taking me to Walt Disney World. He says we don't have a truck to bring back purchases from VA. LOL So awesome are these booths. Sherry, look at all that eye candy galore! Oh how I would love to shop there. Would need a loan, but hey. I saw antlers and dishes and artwork and etc. etc. Thanks for sharing it with us. I sure wish I was coming there. I live in Asheville NC…and you know I think, that I am having a bloggers brunch on Oct 16th. So far there are 13 bloggers attending. If I ever come through your area, I promise to let you know. 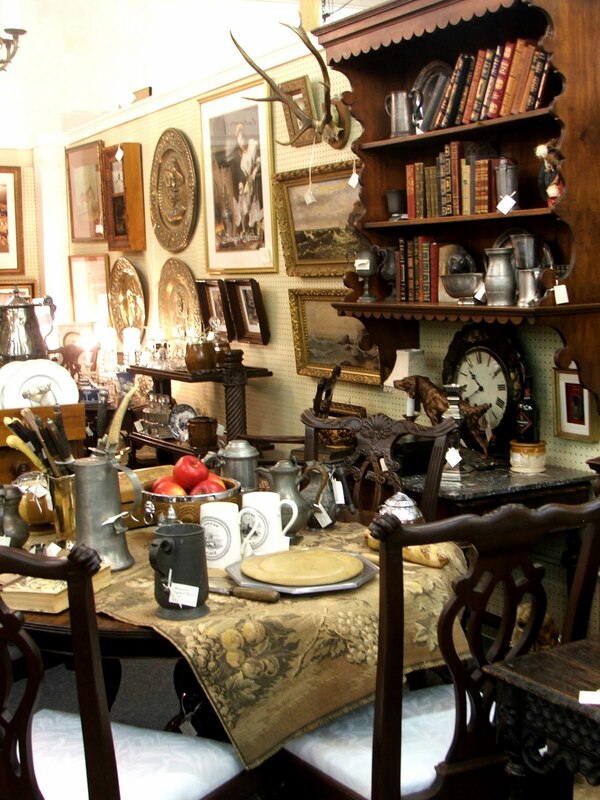 I would love to go antiquing with you! Sherry, I've just spent some wonderful time viewing all the recent posts that I've missed. 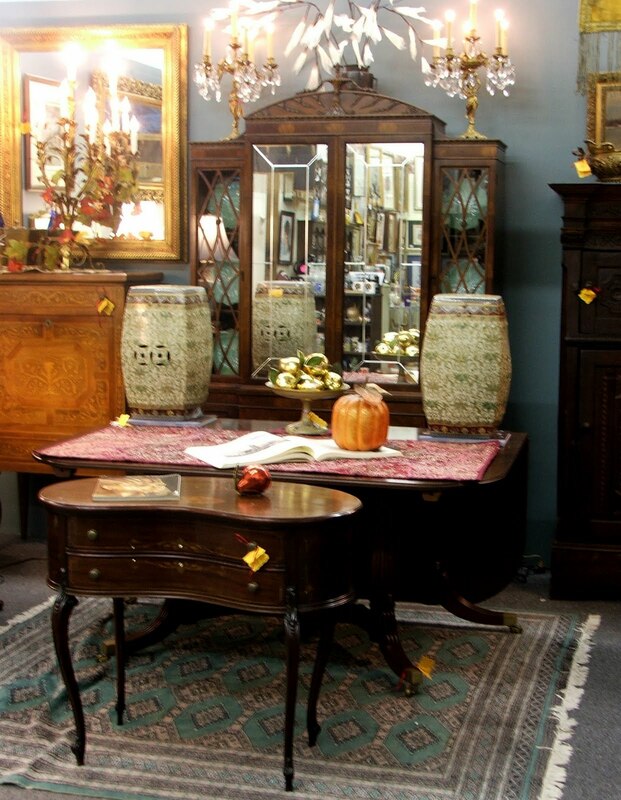 Thank you for sharing all the inspiration from the antique booths. 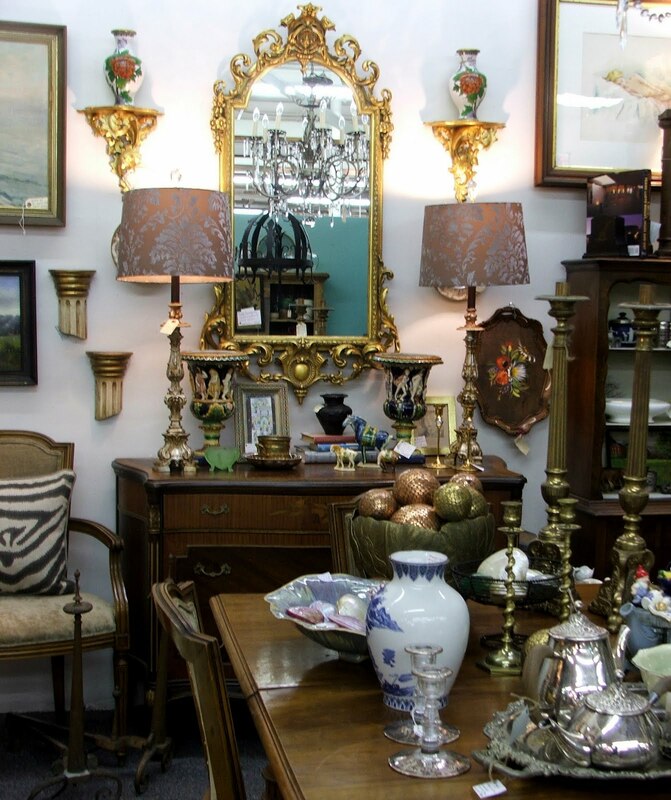 If I lived closer I'd love to go antiquing with you. Acck,,,I feel like I've been MIA, very busy as of late! Love the photos! My Son Andrew lived near Richmond, but he's back in Washington now! Wish I would have made it back there when he lived there…….. I think I have the "Mate" for that wicker chair! It was my Grandmothers,,,,,,looks identical! Love the water dispenser, I can see why you'd want it-gorgeous! Also love those needlepoint chairs! Yummy! My blog friends are scattered all over, many "semi" local whom I've met or hope to meet soon, but I've gotta say, I wanna get my backside down to Texas one of these days and visit some of those Cow Girls! Maybe we should do a Blog Event somewhere in the not so far future and connect! How fun would THAT be??? Lulu Kellogg and I are "meeting in the middle" so to speak at Silver Bella,,,,,She coming from Maryland and me from Washington State…..Can't wait! Looking forward to a week of creating and getting ready for my show in Oct……..
Ooooh, I want to go shopping there! Sorry, I'm from Arkansas, but I love following. Must have missed the post of your booth. I'll go look for it now. Love it all!!! I wish I could shop there!! Oh man, Sherry… I love the vintage linens, and the animal section- and I have always been a sucker for transferware- although I particularly like the reds more. What a fabulous place! I don't know if I could work there, I think every penny I made would be spent right away! Oww I can see some things that I would like to take home with me!! Oh, how I wish the shop were near me although it's probably a blessing in disguise from a financial perspective! Thank you for always providing inspiration, Debra. Sherry, I am from Staunton, Va and my daughter lives in the Fan District. 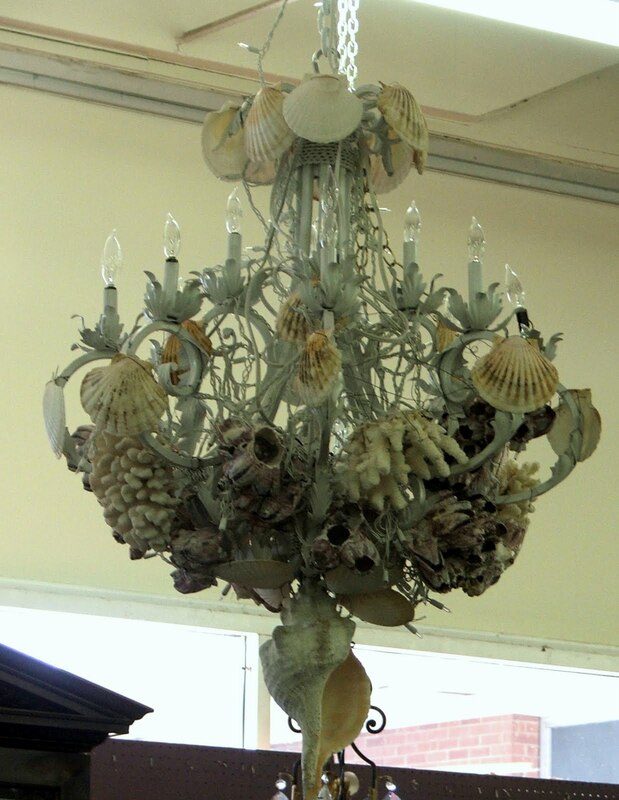 I will have to find this antique mall when I visit jer this fall. There are some beautiful things there! Thanks for the distraction from school! Sadly now I have to get back to abstract art. They would think I've lost it if I started designing this stuff, however I know you would think I'm sane lol! Check your mail at the latest the beginning of next week for your surprise!! Thanks for the plug! I really need to head over to the West-End mall. I'm working at Paragon Place this week, so maybe I'll run over there when I get off! I would love to shop there, as I see some things to buy! I am from NY, the east end of LI. Not that many bloggers I know of from here either! Not sure if you want to venture to Northern VA for this, but it's a great event, and thought I'd forward this info to you (not affiliated with them, just think they do a great job!). 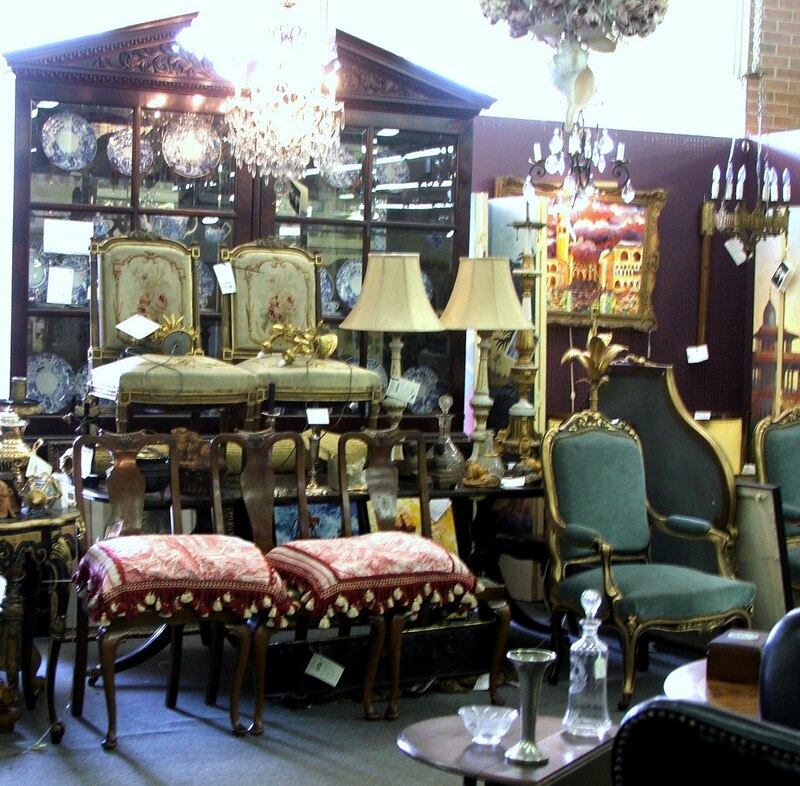 Our next Sale is coming up again, on September 24,25,26 (Fri., Sat. and Sunday) from 10-5 each day! 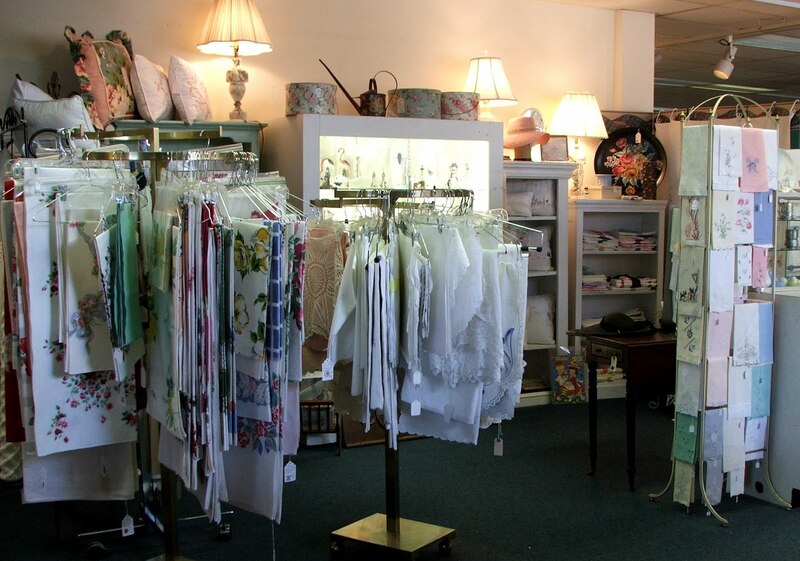 Sale will be held on our premises at 38532 Pheasant Hill lane, Hamilton VA 20158. Mapquest should get you there, GPS has proven problematic in the past, so call us if you need help getting there. 540-454-2944. Cash of checks only. Barn doors open at 10 a.m. promptly, but there is a TENT SALE outside as well as a downstairs area for early shoppers. If you want something, pull the tag, if you change your mind, please put the tag back, so someone else can purchase the item. 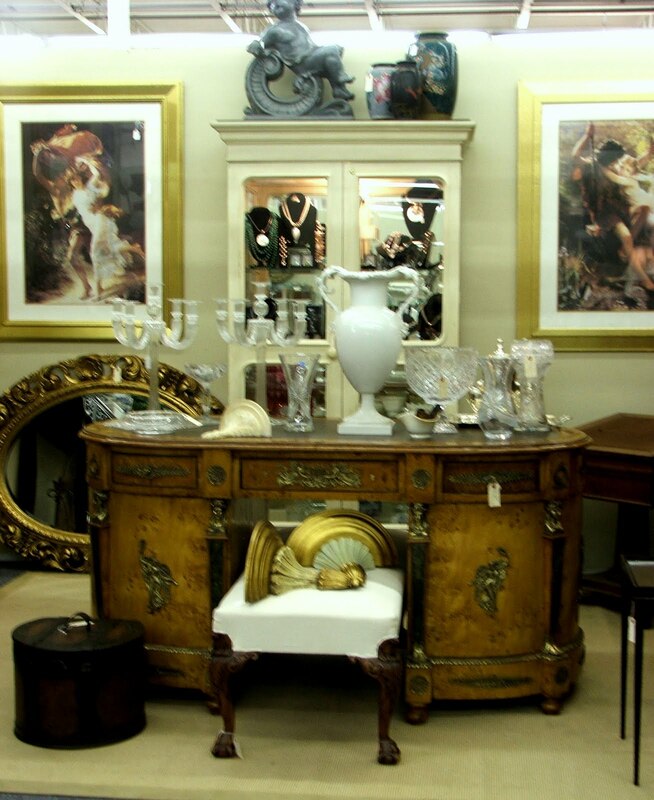 If you would like to see preview pictures please join us on FACEBOOK under EKSTER ANTIQUES. If you have received this message twice or in error, please let us know and we will fix the problem. Thanks for your support and we look forward to seeing you in two weeks! I am a German gal moving to Virginia in a few weeks time! 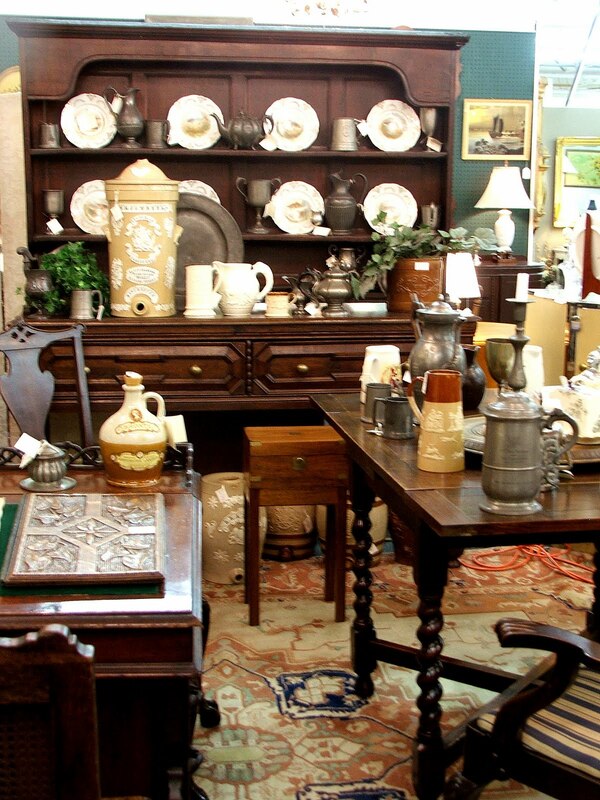 My search for antiques, second hand and thrift has led me to your blog! Have to create a home from the scratch and already source ideas. I love having found your blog and the antique mall.